Putting Your Kettlebell to use. Making Proper use of the cast iron door stopper you may have at home i.e. that kettlebell lying on the floor gathering dust..
Greeting my loyal reader, how are you getting on so far with improving your overall health and fitness in 2018, I’m sure over the last few years, so many of you have bought several pieces of exercise equipment with the genuine idea of doing something to help you look, move and feel better at one time or the other, such as the kettlebell which I noticed was on sale in a number of the local supermarket while I was doing my Christmas and new year shopping and I have seen a few individuals lap up these bargain, it’s now February and I can bet about fifty percentage of those exercises equipment are now gathering dust or in this case the cast iron kettlebell is being used as a door stop somewhere in your home. Well if that’s the case get hold of it now and follow me along in these next few lines of putting those kettlebell to good use, In future proofing your bodies for the years to come. 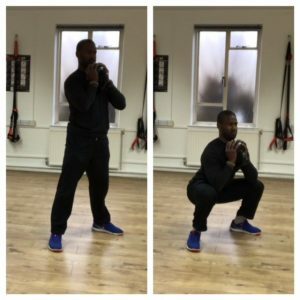 In this article I’m going to show you 4 simple but exercises you can combine to make a workout that you can use in the comfort of your home or the next time you’re at the gym you can make use of the kettlebells there, especially when the gym is busy at this time of the year. 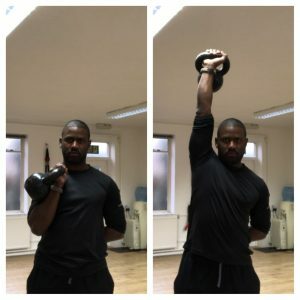 This is the easiest variation of the swing and is the foundation for every kettlebell swinging motions you will come across, so it is important to master this move. The swing loads up the posterior chain and primes all the muscles of your back, and hips which deliver explosively power in your training or any sports you may play, along with explosive power the swing has benefits such as Increasing both your anaerobic & aerobic Capacity and Muscular Endurance. Another option if you only have one bell at hand is a goblet squat. Holding it in this position creates a significant isometric contraction in the arms, upper body and core and can really burn after a few reps, along with strengthen up your lower body it’s a great exercise to teach beginners when learning to squat properly. Do 12-15 reps, rest 30 seconds, then move unto exercise #3. 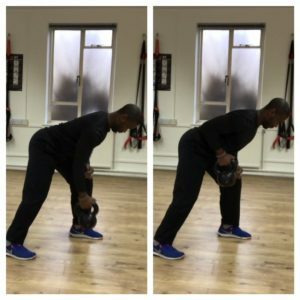 3-One arm bent over row: One-arm rows emphasise the whole Lats, upper back, and the trap muscles which is needed for everyday movement and lifting heavy things around your home and workplace. During this variation you can use your free hand to stabilise yourself by placing your hand on your knee. Remember to get your body into a position so that your upper body is close to parallel with the floor by pushing your bottom back and keeping your shoulders retracted throughout. Row the bell up using your lats, hold and squeeze your upper back for a second and then slowly lower the weight back down without shrugging your shoulders forward. 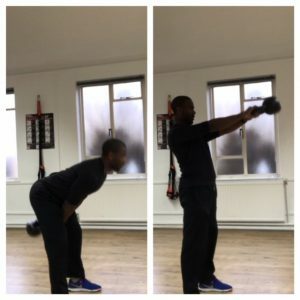 4- One arm kettlebell Press: Apart from helping with building upper body strength and stability around the shoulder joint, it forces each arm to work independently. As most individual have a dominant side, this often overcompensates for the weaker side when you work both arms together in the same exercises. This can leave the weaker side constantly trailing in strength since it fails to do its share of the work. So using single arm exercises forces the weaker arm to press the entire weight and begin the process of creating structural balance in both arm. Do 10-12 reps, rest 30 seconds, return to #1 exercise and repeat the whole process for 3-6 sets. The power of monitoring your daily and weekly habits. Start 2018 with a Banging but simple training program to set the tone for the rest of the year. Anthony Jedesoa on How To Work Out Your calories/Macros For your Fat Loss goal. Mata kuliah fakultas hukum on ARE YOU GETTING ENOUGH Zzzzzzzzzzzzzzzzzzz Part 1. Susanna on A brief checklist to stay on your weight/fatloss journey. best financial planners on Sweat-a-bucket HIIT Dumbbell Workout. best financial planning tools on Sweat-a-bucket HIIT Dumbbell Workout.